This is a short video - the first in a new series of Sounds of the Bazaar videos - made as a contribution to a workshop on 'Technology-enhanced learning in the context of technological, societal and cultural transformation' being held on November 30 to December 1 in Garmisch-Partenkirchen, Bavaria. 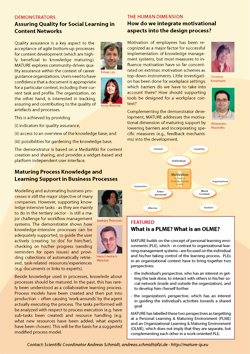 In September, we organised a symposium on Personal Learning Environments at the the 2nd World Summit on the Knowledge Society (WSKS 2009), "an international attempt to promote the dialogue for the main aspects of the Knowledge Society towards a better world for all." People Tagging presented at interdisciplinary workshop "Social Software @ Work"
Simone Braun was invited to present MATURE's approach on People Tagging for Collaborative Competence Management at the workshop "Social Software @ Work", DÃ¼sseldorf. The interdisciplinary workshop was organized by the Heinrich-Heine University with the goal to bring together researchers and practitioners around the topic Social Software. The workshop provided a great forum for lively discussions about People Tagging and Collaborative Competence Management in practice. Embedded in the 2nd World Summit on the Knowledge Society we had a symposium that was related to the topic of Personal Learning Environments. Graham Attwell, Maria Perifanou, Cristina Costa, Ricardo Torres and me presented complementary papers talking about PLEs, Digital Identity, Contextual Learning and Communities of Practice. It was a great platform to present ideas about challenging aspect of mobile learning and the first international conference where the Widget (Messaging) Server developed by UPB could be presented in action. 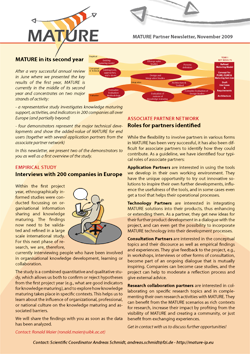 At this year's edition of the International Conference on Knowledge Management (I-KNOW 09), the MATURE has taken the opportunity to raise the awareness of the community for MATURE and to present the first year's results.